That's enough from me. 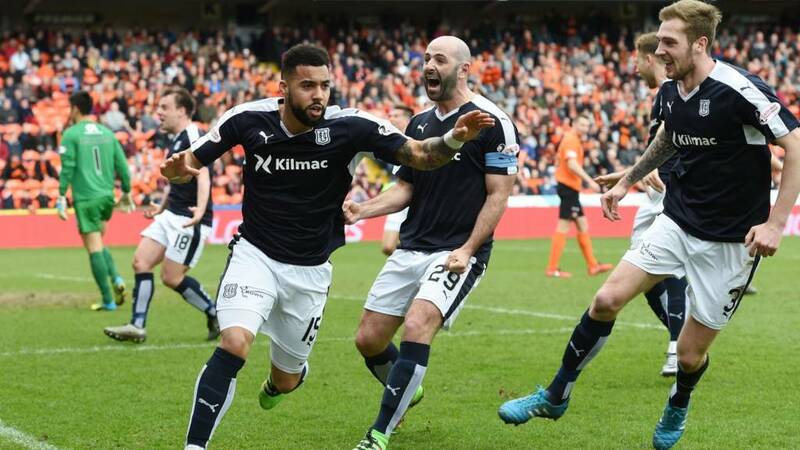 I'm absolutely shattered after that dramatic Dundee derby... You can see highlights on Sportscene at 22:30 on BBC One Scotland tonight, along with all of the other action from the weekend. Saturday's highlights will be available online from 18:00. We've got an international break coming up, with Scotland involved in a couple of friendlies. When the Premiership resumes on 2 April, United are away to another local rival, St Johnstone, while Dundee host Ross County, the team they have their sights on in the top six. "If you're behind, the upper hand is with the opposition. It's going to be tough for United and victories are so important. For Hamilton and Kilmarnock, draws are okay," BBC Sportsound pundit Willie Miller on the battle to avoid the drop. "I was getting plenty of pelters from the Dundee fans during the game, they were right above me. "It all went quiet when we scored and I asked 'where are you?' They were still there! "I gave them a little wave afterwards." "The boys had tremendous spirit. I'm a little bit disappointed we didn't take three points, I thought it was there for us. "There was good stuff and not so good stuff. "We are alive and kicking and we'll just keep our heads down and keep working." "I thought we defended brilliantly and the attitude was brilliant. It was just that one moment that has cost us right at the end. "I'm not going to complain about the red card, it's not my style. "You can't plan for losing two central defenders and your goalkeeper. The heat of the battle is great stuff!" Dundee move up one place to seventh in the table, leapfrogging Partick Thistle courtesy of goal difference. Paul Hartley's men have played a game less than Ross County, who are three points better off. Dundee United fans may disagree with Mr Spence's assessment there since every point is precious right now. The Premiership's bottom side are now seven points behind Kilmarnock, with a game in hand and two games to come against the Rugby Park side. "It was a hugely entertaining, passionate derby but it doesn't really advance the cause of either team at the end of the day," says pundit Jim Spence on Sportsound. Well, well. What a game! The relegation trapdoor was opening wide under United after that first-half brace from Kane Hemmings. However, Billy McKay matched that double with a penalty and a stoppage-time header to secure a valuable point for the hosts. Dundee lost two centre-halves to injury, a goalkeeper to a red card and replaced two of their substitutes. Both sets of fans were making an incredible din over those closing stages. Brilliant! David Mitchell may have messed up when challenging for that cross with Edward Ofere but the Dundee keeper atones with a great one-handed stop to keep out a Gavin Gunning header. The ball falls to Coll Donaldson and the defender can only sky it over from 10 yards. Wild scenes at Tannadice as United grab an equaliser. Edward Ofere beats keeper David Mitchell to a high cross and Billy McKay flings himself at the loose ball in front of goal to ram in a close-range header. Four minutes added on. Can United find a leveller? The visitors break and it's two against two as Nick Ross gallops forward but his pass can't find Kane Hemmings and United are still in the game. Edward Ofere is booked for trying to punch in a corner after a Superman leap at the ball. Even with their hands United can't get it in the net and the ball flies over! "If you're a United fan, you are on the edge of your seat and, if you are a Dundee fan, you are on the edge of your seat," says BBC Sportsound pundit Willie Miller, presumably from the edge of his seat at Tannadice. The waves of Tangerine attacks keep coming as David Mitchell punches away a cross from Blair Spittal.